Life With a Whisk: To each their own. 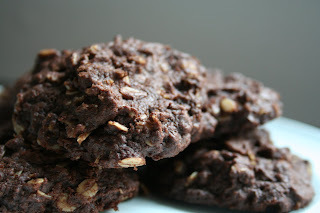 Caroline and Claire of Bake With Us chose this week's Tuesday's With Dorie selection of Chocolate Oatmeal Drops. This was one of those no-appliance-necessary recipes that we can all appreciate, and minimal bowl usage used too! It brought me back to those early baking days when the only recipes I would attempt required a bowl and a wooden spoon or whisk, sometimes they were from a box, and they more often than not turned out well! Techniques have gotten a little more complicated since then, and bowls, spatulas, measuring cups, sieves, cutting boards, and serrated knives really add to the dish load, so every once in awhile it's a breath of fresh air to throw everything in a bowl and stir. This recipe was so simple and straightforward, and Dorie's warning that the butter would separate from the other melted ingredients when the mixture got too hot was absolutely necessary. I simply took the bowl off the heat for a little bit, continued stirring, and the parts became one once more. The final batter was quite soft after just being mixed, but when scooping each subsequent batch, the batter got firmer and firmer. I feel like the firmer batter made for a cookie that held its shape better in the oven even if the actual composition of the cookie was no different from the softer batter. My drops didn't spread in the oven like those of other bakers in the P&Q link, and though delicate, the individual cookies were actually pretty easy to transfer to a rack straight out of the oven. I can only assume this was due to having the batter sit out longer before baking. The finished product was not as thrilling as I had hoped. Normally, I love the addition of rolled oats to cookies, but the oats just seemed to make for an undesirable texture this time. Too much chewing for a crumbly, brownie-type cookie. I enjoyed the deep chocolate flavor and hint of cinnamon though. The cookies do taste better with age. It's been two days and I think it's a tastier cookie than when I first took it out of the oven (which is often the case with chocolate desserts, don't you think??) Other people are loving this cookie, so I'm not quite sure why it doesn't have the same allure for me, but to each their own. I'll go hang out with Dorie's rugelach! They sure look good even if they weren't a fav. for you!! They were simple to make but not number one on my list either!